Glancing at the to-do list on my desk that I’d scribbled just hours before, the scrap of paper seemed to have appeared from some alternate universe too banal to be believed. Set alarm for 6 a.m. Take out the trash when I go out for an early-morning run. Bring some money to buy fruit for breakfast on the way home. As shots rang out outside my window and concerned messages pinged in from friends and family around the world, my editor at CityLab, The Atlantic's website on urban issues, asked me if I'd like to write something about my personal experience of being in Istanbul during what turned out to be a failed military coup. 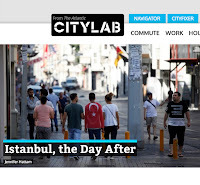 Read the rest of that essay, "Istanbul, the Day After," on CityLab.